This winter, the hankies are coming out. It isn’t just because this is the season of sniffles. A current hankering for retro men’s accessories, such as hats, tie bars and pocket squares, is reawakening interest in handkerchiefs, some retailers say. After years of being tucked away while a germ-conscious society turned to tissues, the humble handkerchief is being rediscovered and in some cases reimagined with bold patterns and colors. “In the way that skinny ties and tie bars are once again [au] courant, the cotton handkerchief has come out of the bottom drawer and found its way into the pockets of some of the hippest dandies,” says Tom Kalenderian, executive vice president of the men’s department at Barneys New York. Its Madison Avenue store features two table-size display cases of handkerchiefs on the first floor, which he says would have been unimaginable 20 years ago when the store opened. Colored and patterned handkerchiefs are prominent. 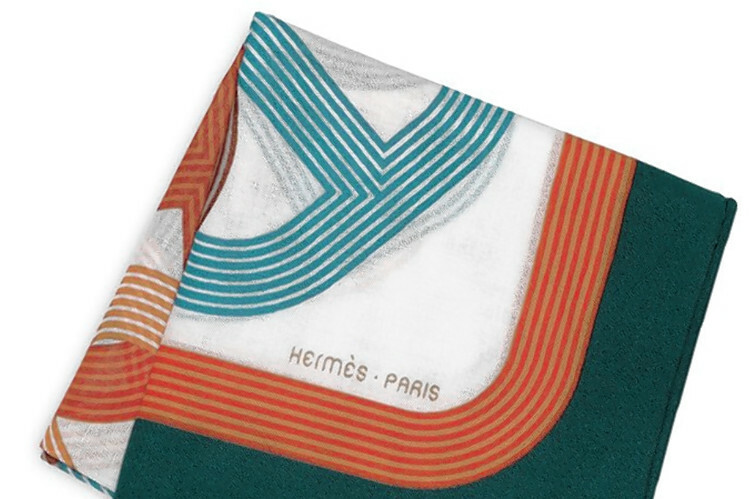 At Hermès, the white handkerchiefs aren’t necessarily plain. The Faune Lettrée line, launched this year, features the word “Hermès” spelled in quirky abstract letters arranged so that “however you decide to fold it or wear it in your pocket, you can have any letter showing,” says Robert Chavez, president and chief executive of Hermès of Paris. Handkerchiefs today are “one of our fastest-growing accessories categories,” he says. The handkerchief shouldn’t be confused with the pocket square, which is meant to be purely decorative. One is for blow and the other for show, according to a common refrain in the menswear industry. Handkerchiefs are typically cotton or linen, while pocket squares are more likely to be silk and boast bolder patterns. A neatly folded white cotton handkerchief can, however, be used decoratively, placed in the chest pocket. 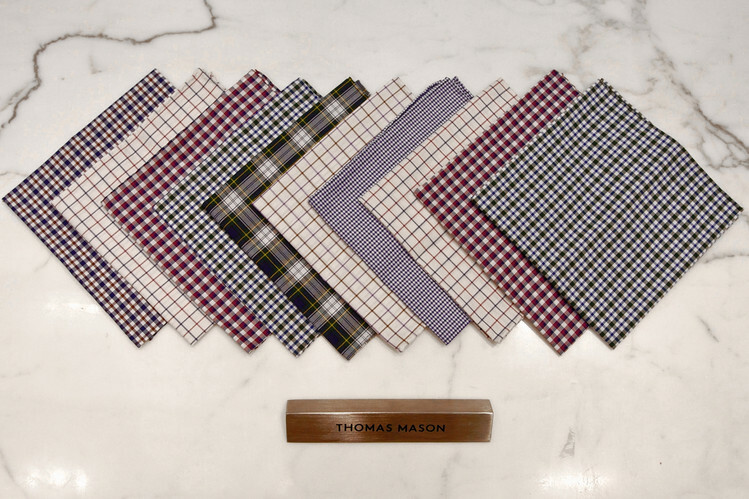 In the past seven or so years, as the menswear industry has pushed a more-dressed-up look inspired by past decades, pocket squares exploded in popularity. Now, the functional handkerchief is enjoying a renaissance as well, according to some retailers. Mr. Chavez at Hermès attributes some customer interest in the house’s handkerchiefs to the whimsical design characteristics they share with Hermès pocket squares. 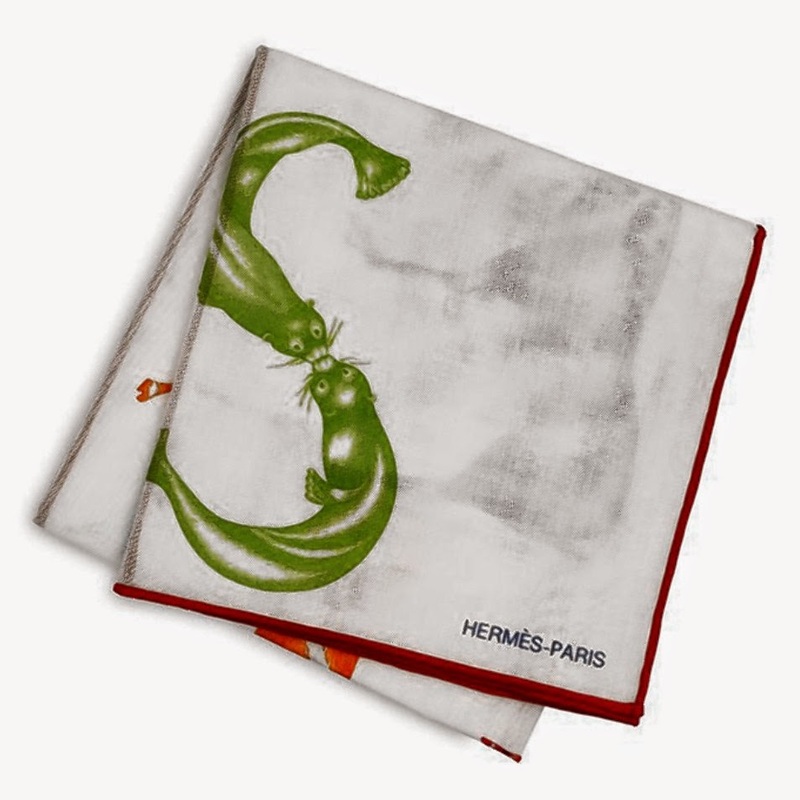 Hermès has a half-dozen types of handkerchiefs, from classic white to colorful. 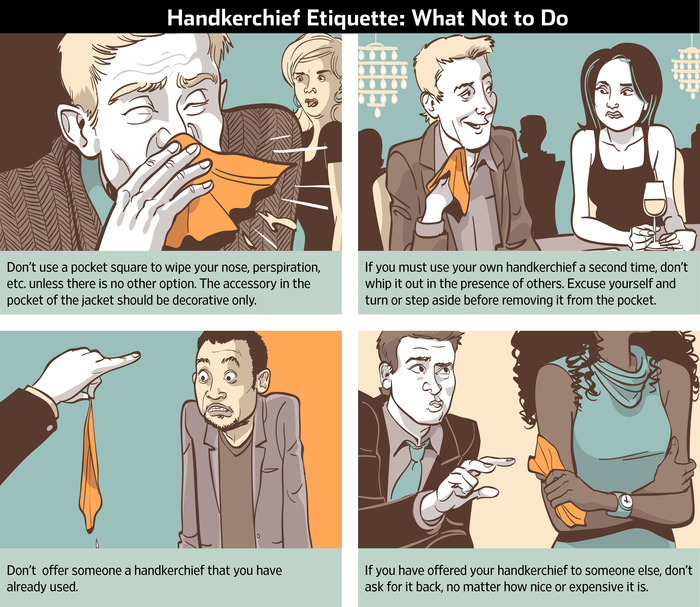 Since handkerchiefs have been outside the mainstream consciousness for some time, many younger men may require a handkerchief 101 class in etiquette and handling. 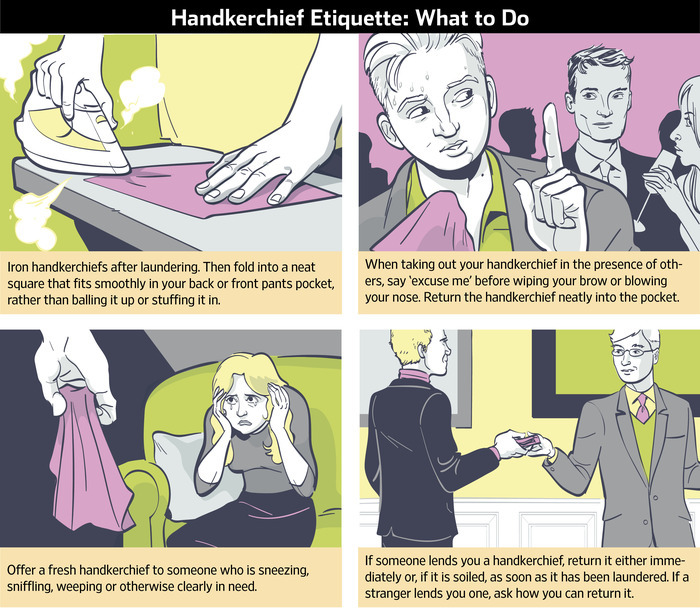 “If I saw a person just sneeze or with perspiration on their forehead, and they were trying to wipe it with their hand or sleeve, and I had one in my pocket, I would offer them my handkerchief,” says Peter Post, managing director of the Emily Post Institute etiquette specialists. Mr. Post, author of the book “Essential Manners for Men” and one of the four great-grandchildren of Emily Post, says the handkerchief should be a fresh one. “You wouldn’t offer someone a used tissue either, so don’t give someone a handkerchief that has already been used,” he says. The recipient ideally should return the handkerchief either immediately or, if soiled, as soon as it has been laundered. Growing up, Mr. Post, 64, recalls his father “always had a handkerchief in his pocket.” Mr. Post says he carries pocket tissue packs instead. His father’s handkerchiefs “always made me uncomfortable,” he says, citing fears they harbored germs. With handkerchiefs, the “ick” factor inevitably comes up. Aaron E. Glatt, an infectious-disease specialist and spokesman for the Infectious Diseases Society of America, says he isn’t aware of a study that shows handkerchiefs are more germ-spreading than tissues. Still, he says, “if you blow your nose with it and your hands are moist from all the secretions, then you go and touch somebody else or an object, you can be transferring the virus.” A handkerchief user should wash or sanitize his hands right after using it. Dr. Glatt, also executive vice president of Mercy Medical Center in Rockville Centre, N.Y., adds that touching “somebody else’s handkerchief could be a problem” if it isn’t clean, since virus can still be present in a damp handkerchief. Handkerchiefs go back to ancient Greece, where a little square of fabric was used to blow one’s nose. But it was in the late 1300s that they were popularized by England’s King Richard II, according to Mark-Evan Blackman, former chairman of the menswear design department at the Fashion Institute of Technology. They were used primarily by society’s elite but gradually were adopted by the masses. Women, too, carried handkerchiefs, often in their pocketbooks. But starting in the 1930s, handkerchiefs began falling out of favor, as Kleenex facial tissue was actively promoted as a more hygienic alternative. 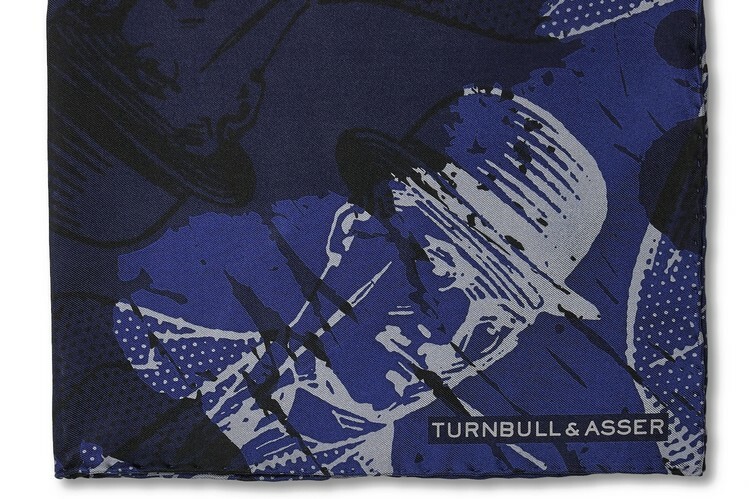 Turnbull & Asser sells colorful and patterned cotton and linen handkerchiefs made from shirt fabric, and recently launched a limited-edition set of silk handkerchiefs with designs based on a mural on the side of its Manhattan store. 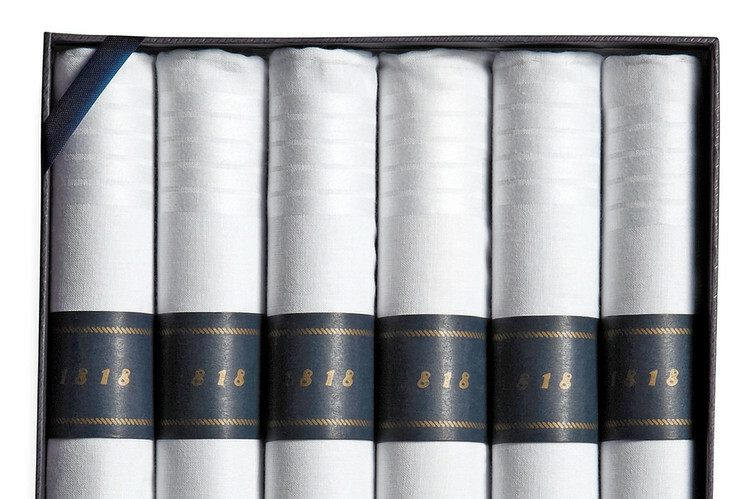 Its best-seller, Mr. Fayed said, remains a six-pack box of white cotton handkerchiefs, each with its own subtle detailing. At Brooks Brothers, handkerchiefs sell well year-round, but Christmas is the best-selling period, followed by Father’s Day, says Guy Voglino, vice president of men’s global merchandising. Handkerchiefs typically come in white cotton and Irish linen and in packs of three, six, seven or 13, and they can be monogrammed. Other men who may have put away their handkerchiefs find they are handy again. Todd Keefer, a 44-year-old case worker for Pennsylvania’s human-services department, used to carry handkerchiefs years ago but felt they were a little “gross,” he says. In the past two years, though, since moving to Philadelphia and walking and using public transportation rather than driving, he has found handkerchiefs useful, and now owns about eight. He likes to have them when his allergies flare up on a subway or bus, he says.